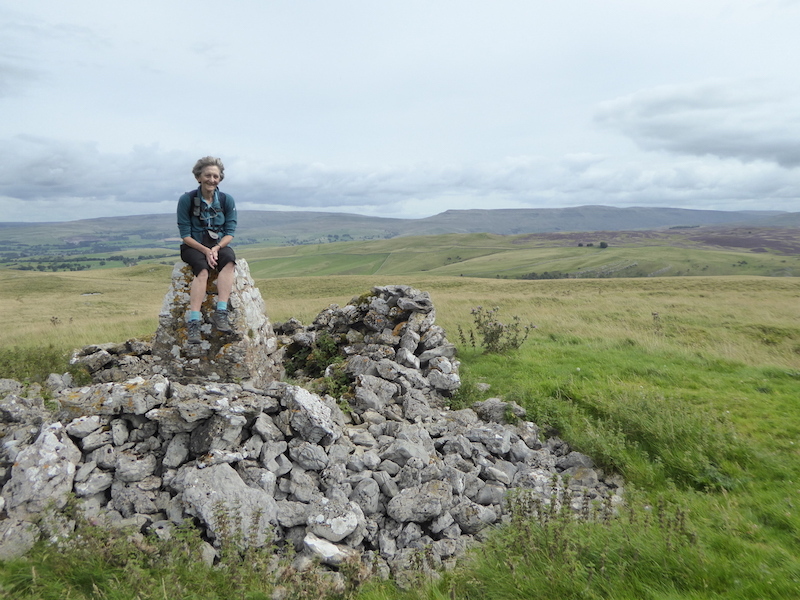 For our walk today we decided on one of the walks featured in Vivienne Crow’s ‘Walking in Cumbria’s Eden Valley’ guide book, published by Cicerone. 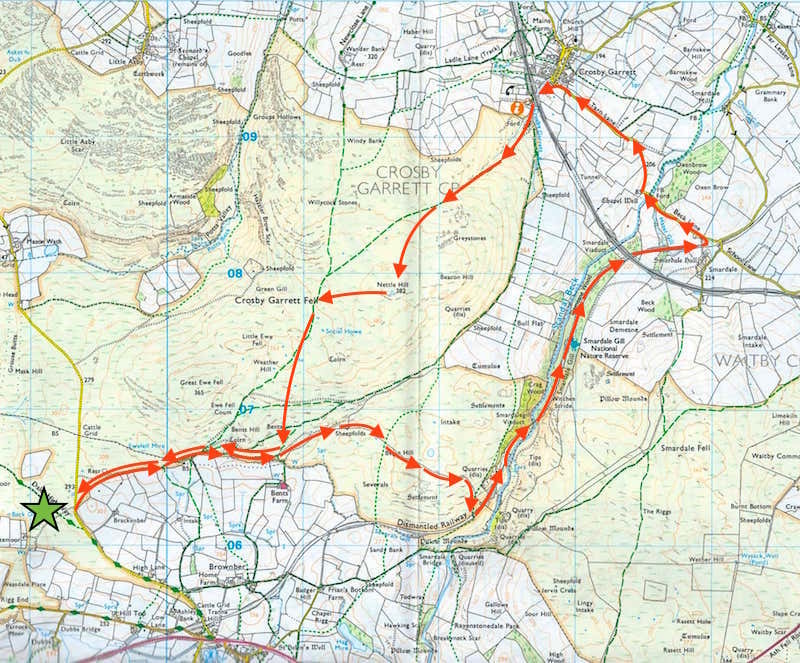 This is a walk which has a little bit of everything, easy walking on wide open moorland, a track following the route of a former railway, old quarries and lime kilns, a 90′ high, 14 arch viaduct crossing a deep ravine through which flowed a crystal clear gill, a lovely woodland walk full of wild flowers and alive with butterflies, a grade II listed building dating from medieval times, and just when you might have been thinking it was all a bit too easy, it was all rounded off by a decent bit of uphill walking to the top of Nettle Hill and then back down to the start point. The distance of 8.5 miles given in the guide book is a little less than the 9.5 miles our gps recorded, but that didn’t matter in the least because the entire walk was so interesting we barely noticed the miles we were covering. All in all an excellent walk and a really good day out. 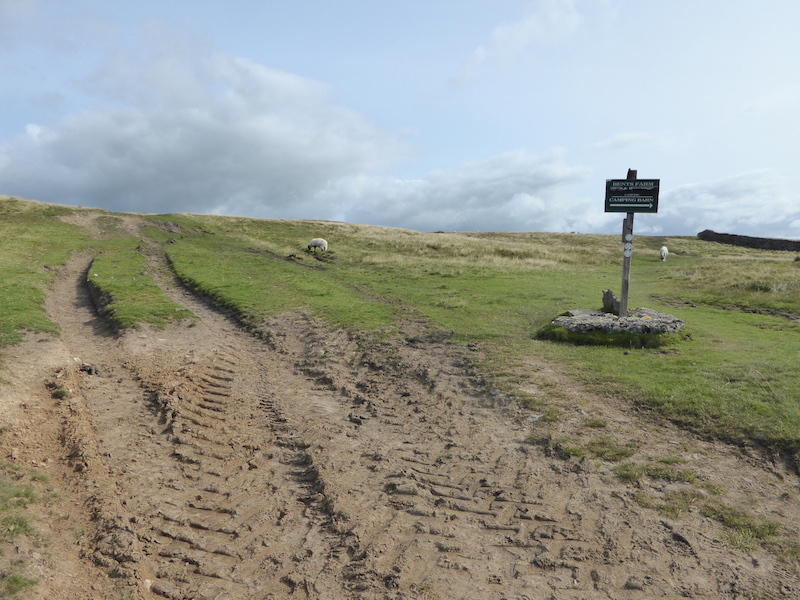 The starting point of the walk is this bridleway sign on the open fell road about one mile north of the A685 at Newbiggin on Lune. The turn off is signed for Kelleth but having made the turn ignore the road going off to Kelleth almost immediately to the left and continue straight up the road until you come to the wall and the sign. There’s plenty of space for roadside parking on the grass verges. 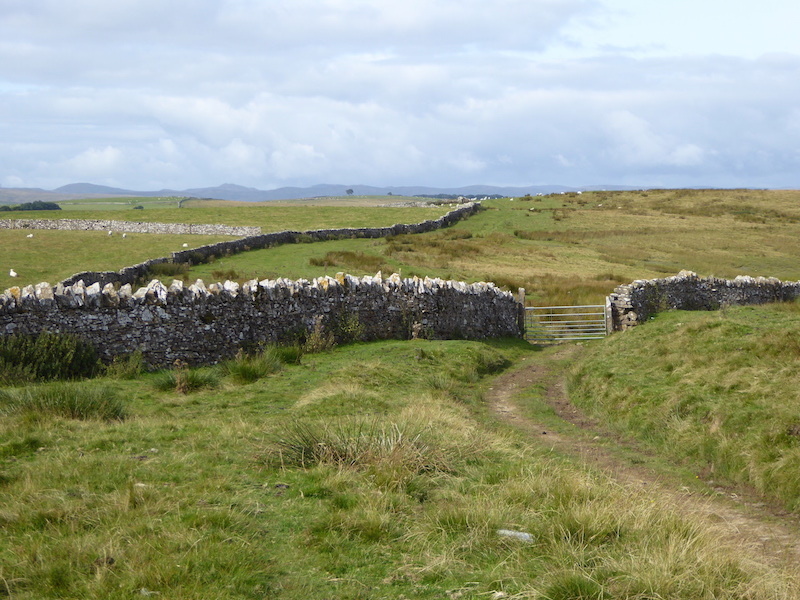 A wide grassy track up a gentle incline offers some lovely easy walking as we keep the wall on our right. The path begins to curve gently and beyond the curve we crossed a slightly rougher and puddly section of coarse grass to reach a wider and firmer track heading up a small rise. At the top of the rise we see the gentle foothills of Crosby Garrett fell ahead of us. 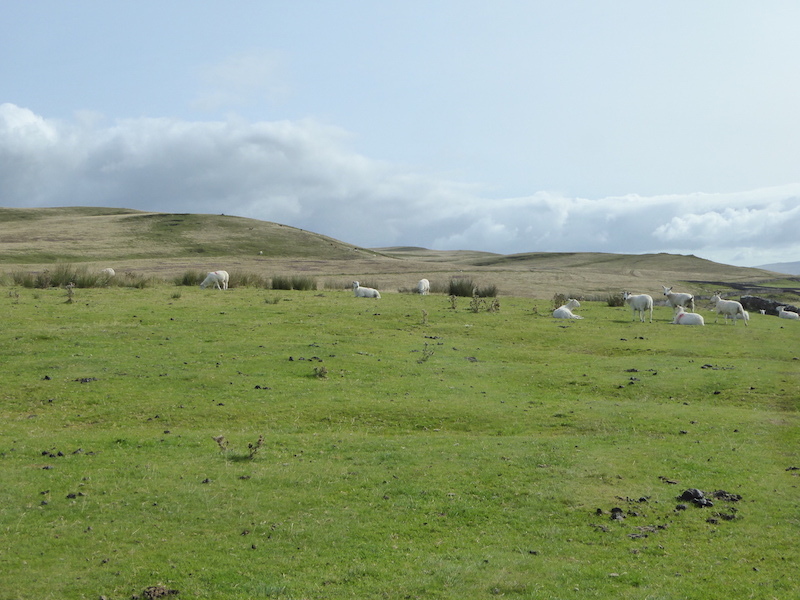 The sheep were busy keeping the grass down and although its not clear in the shot the route is well trodden and obvious. Keeping the wall to our right we settle down into an enjoyable tramp across the surprisingly dry path. 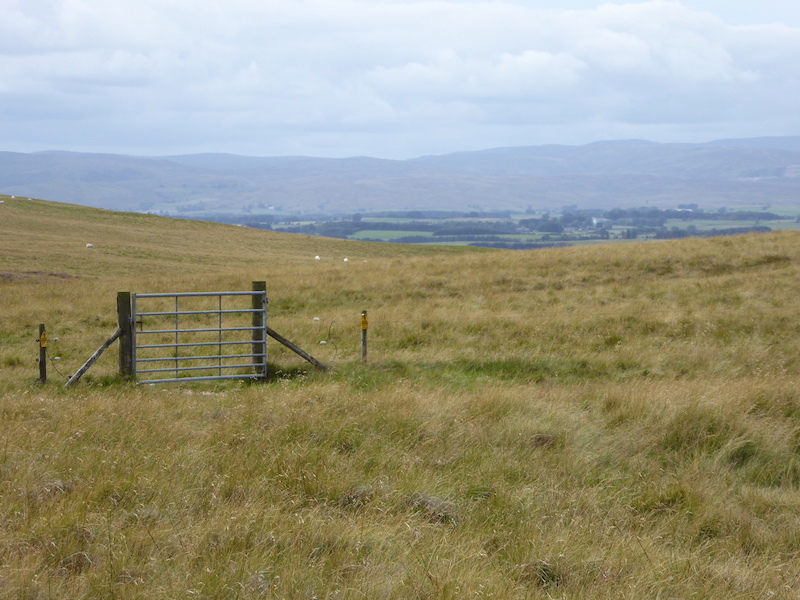 A look back, after we passed through the gate, to the top of the rise where the sheep were grazing. 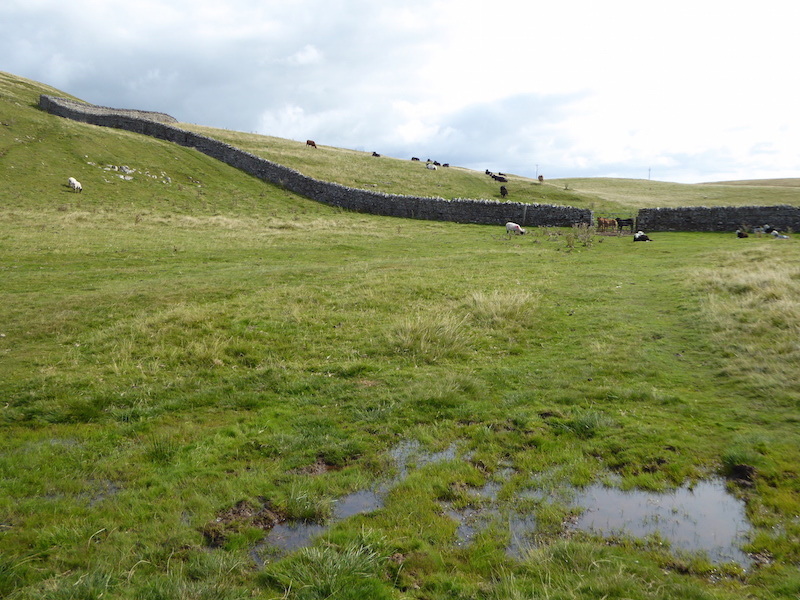 The grassy route, becoming more of a farm vehicle track just here, hugging the wall all the way along. Its a warm morning and the long sleeved layers just had to come off once we were out of the breeze blowing at our backs from the west. 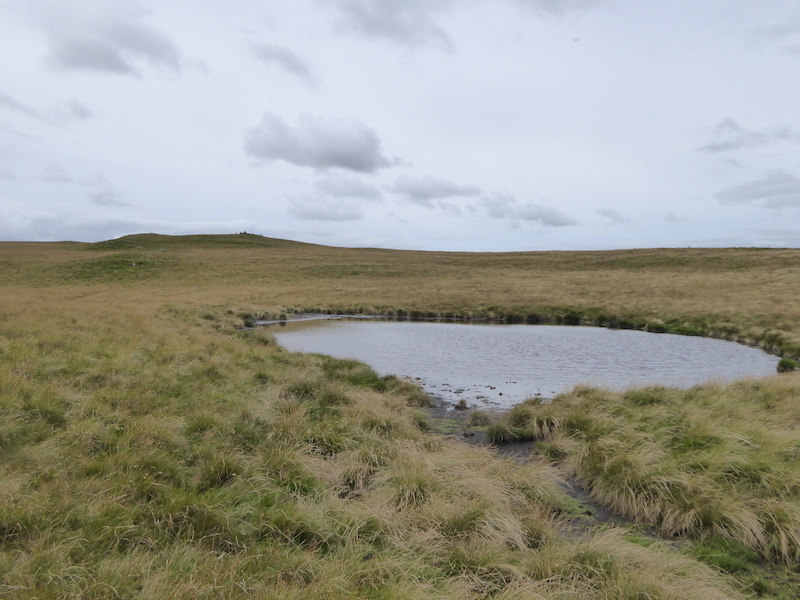 Wild Boar Fell on the skyline as we reach a dip in the ground where a resourceful solution to the problem of sheep falling off rocks has been created. 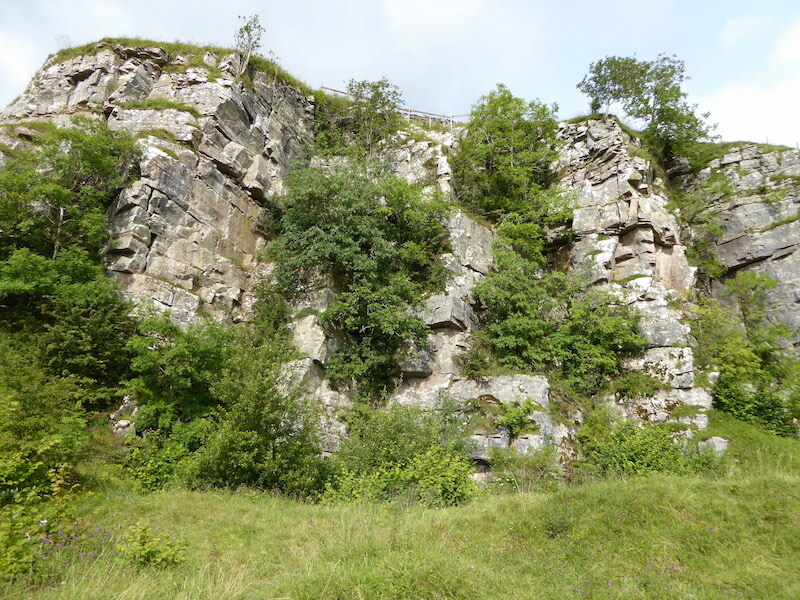 Why follow the contours of the dip when you can just build the wall straight over the outcrop. The wide grassy track continues across towards Bents Farm with only the occasional puddle, easily avoided, where the ground dips slightly. No worries about soggy boots today thank goodness. The wall hasn’t disappeared, we still have it on our right but it is temporarily hidden from view down the right hand slope. 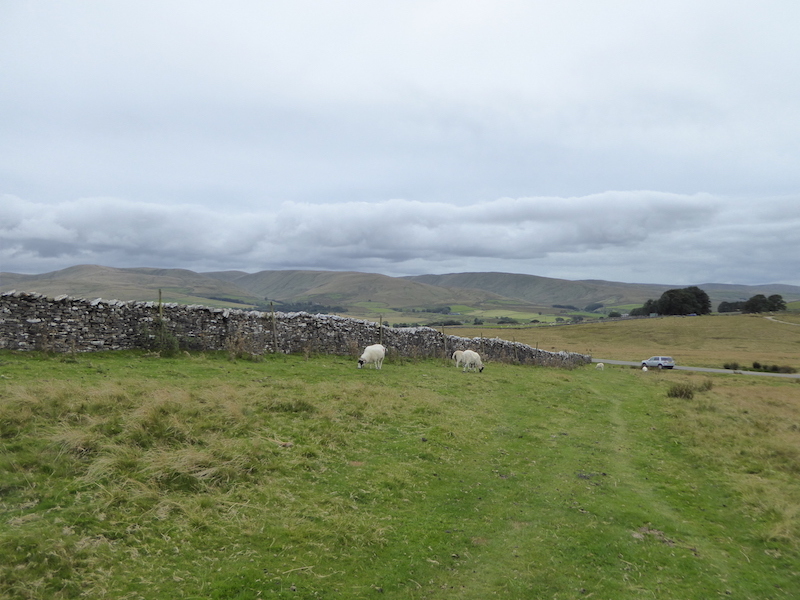 On the skyline straight ahead we can see the long sweep of Mallerstang Edge. 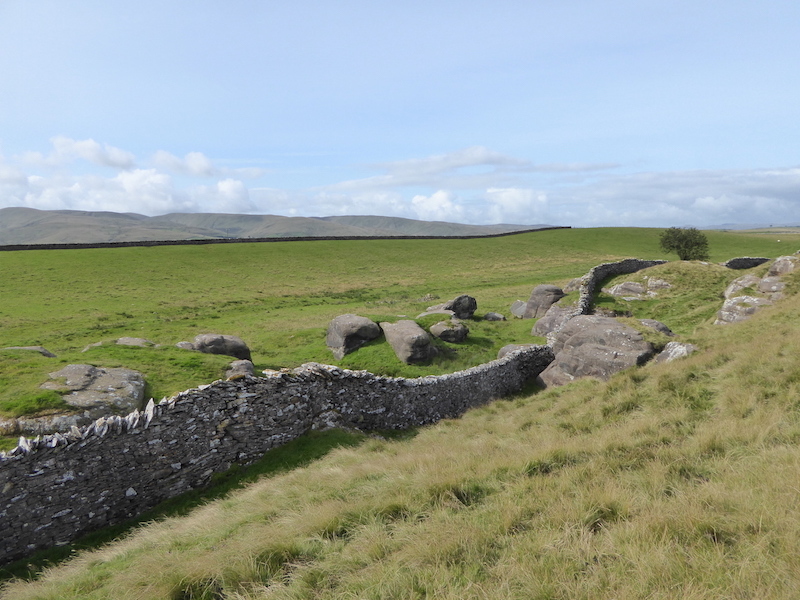 Down in the slope and once again the enterprising stone waller from long ago spurned the idea of threading a dry stone wall through this sprawl of boulders and simply built his wall directly over whatever lay in his path. We arrive, from the left of the shot, at the green sign indicating the path to Bents Farm, where a fourteen bunk self-catering camping barn is available. All you need is your clothing, toiletries, a sleeping bag, your food, and some £1 coins for the electricity meter. Everything else is provided and no tent needed. Well, it sounds better than sleeping out under canvas but I’m still not tempted! 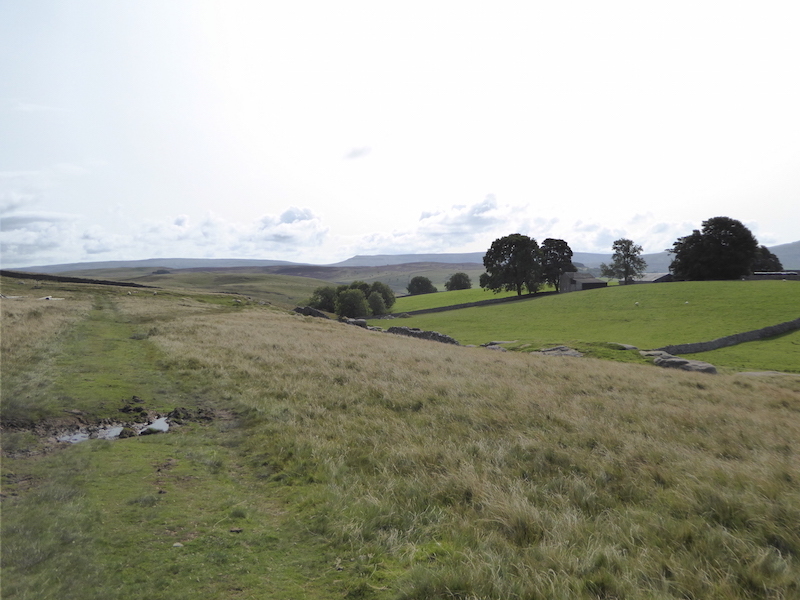 Anyway, back to the walk and at this point we carry on straight across the deeply rutted, but dry, track back on to the grassy one with the wall still over on our right. 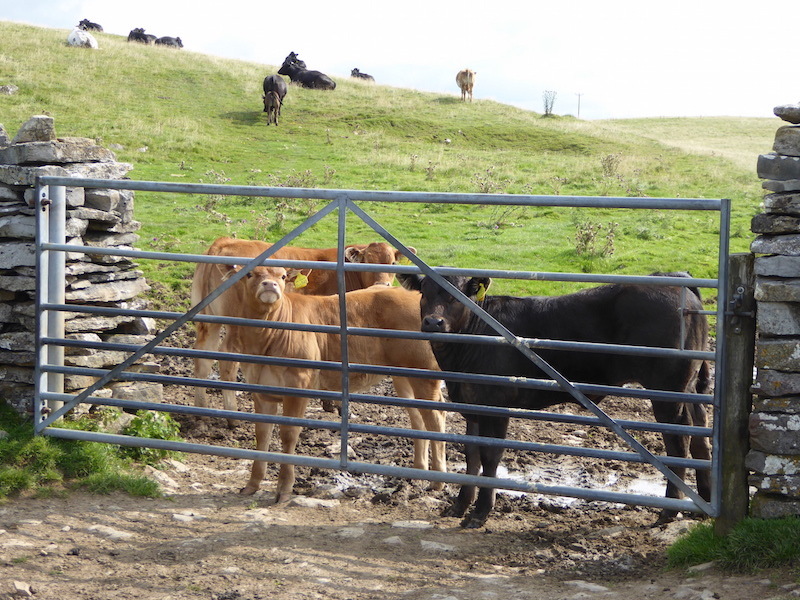 The wall begins to bear left up the hill and, avoiding the puddle, we make for the gate where some young calves are waiting to greet us …..
….. although it wasn’t so much a greeting as a disdainful glare. Fortunately as we approached the gate they decided to move a short distance away up the hillside, so we didn’t have to be concerned that they might make a bid for freedom the minute we opened the gate. We were still getting the hard stares as we passed through the gate, beyond which there was a large patch of very churned up patch of ground. 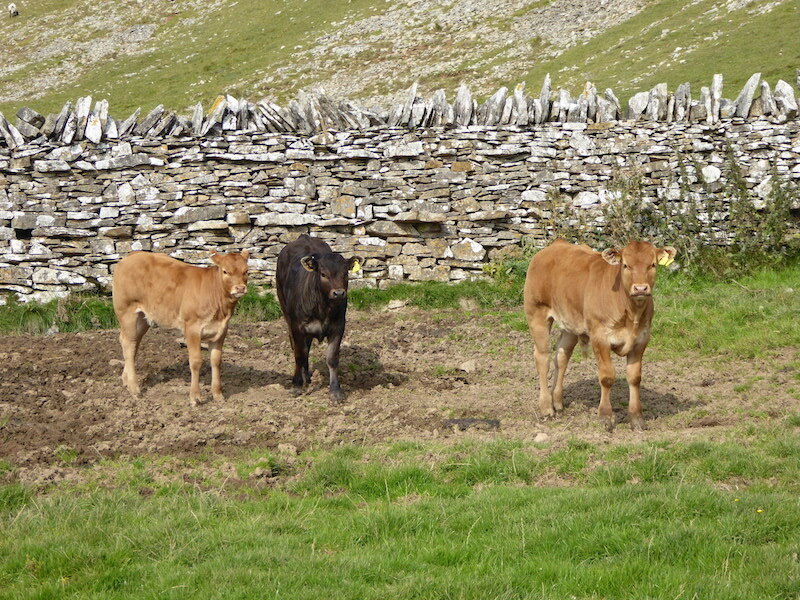 Where the calves are now standing it was quite dry but wetter nearer the gate so after passing through the gate we kept close to the wall where we found patches of drier ground. 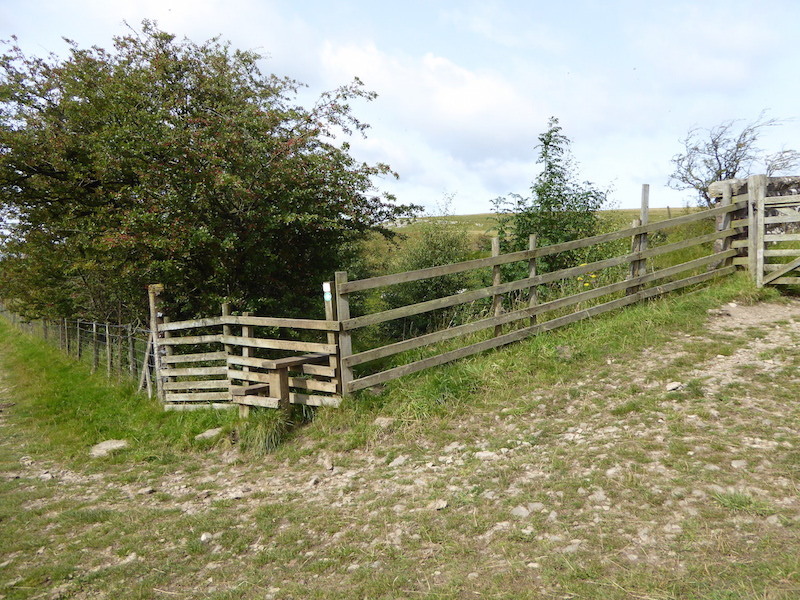 The calves drifted back to peer through the gate again and we carried on, again with the wall on our right, until we reached this stile, the point at which we cross the wall. 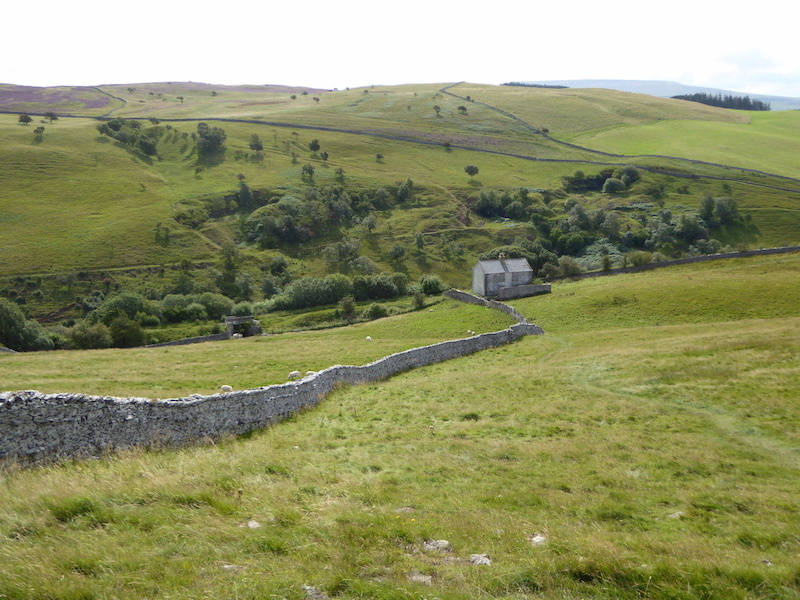 Over the wall, which we now keep to our left, and onwards towards Smardale Gill. 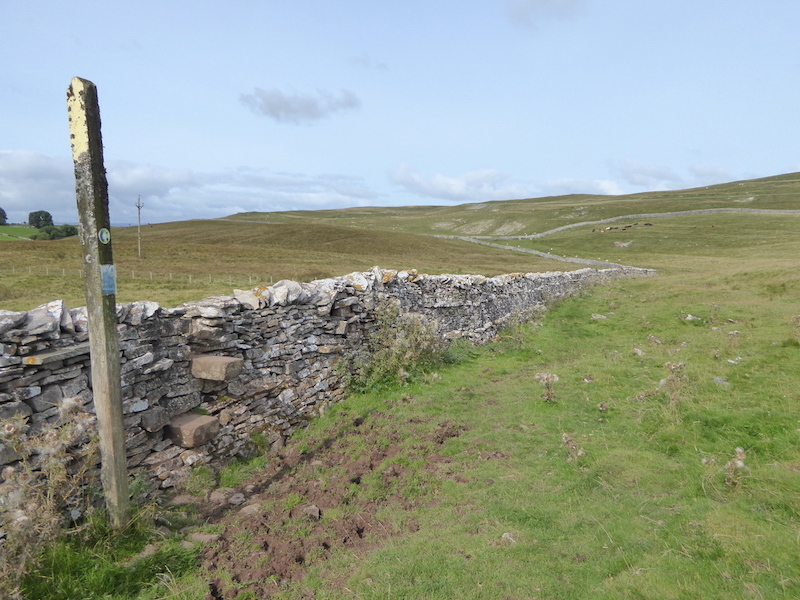 The ground to our right once had an ancient and extensive village settlement, known as Severals which is marked on our route map, although there is nothing remaining which would give you much of an idea of its past existence. Apparently the site has never been excavated, which is surprising as there must be plenty of history to uncover beneath this moorland grass. 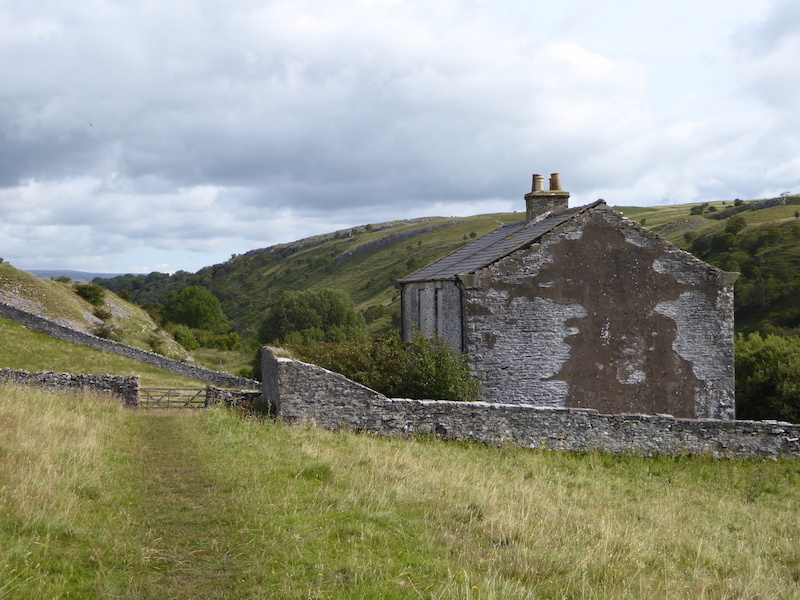 Eventually the track leads us downhill towards this boarded up house overlooking the old railway line along Smardale Gill. 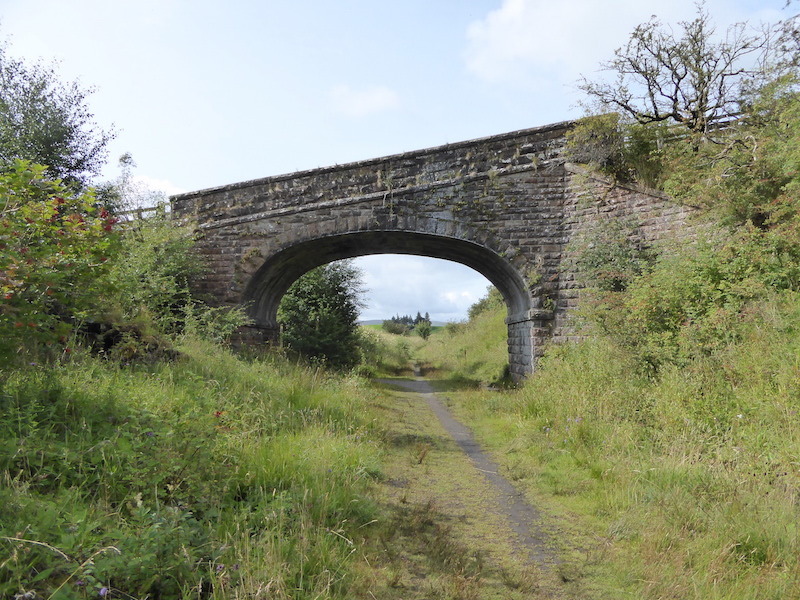 A sign on the wall surrounding the house directs you to the right …..
….. and after a few strides we turn left through this gate and across the railway bridge to the gate at the far end …..
….. where we sit on the stile and take a Mars Bar break before climbing the stile and descending the railway embankment down to the old line …..
….. where the tracks have been removed and a walking trail provided. I take a look back at the bridge we have just crossed and then we walk just a short distance …..
….. and pass in front of the boarded up house. 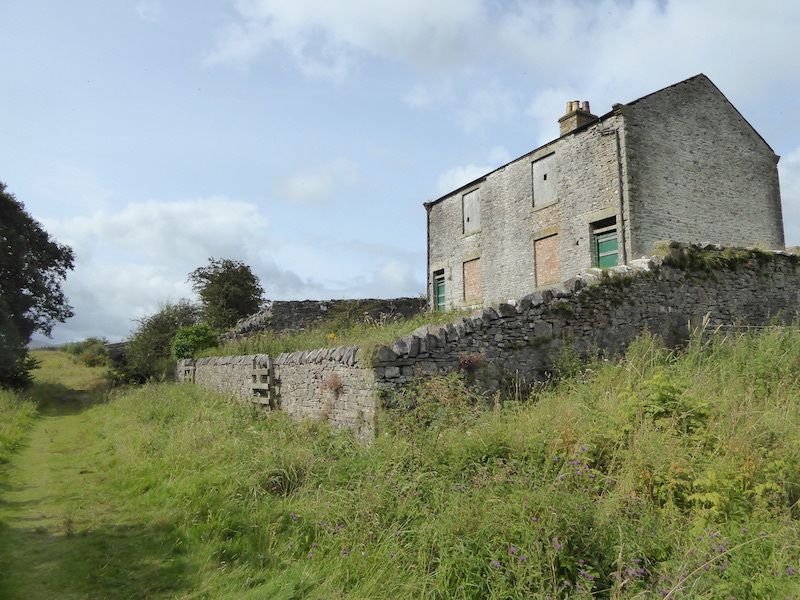 Its obviously not a farm house so we speculated that it may have housed railway employees. Whoever the occupants were they had a grand view across Smardale Gill from their bedroom windows. The old boarded up house had us thinking about old railways and their employees, and remembering the time when travelling in trains hauled by steam locomotives was nothing out of the ordinary, yes we are that ancient! It was simply what you did to get around. Standing on platforms looking anxiously along the line wondering when the train would arrive, straining our ears listening for the tell tale distant rumble as it approached, finally seeing the clouds of steam rising above tree tops and relaxing into the knowledge that it was, at last, about to arrive. The engine would trundle slowly into the station and cover it and the waiting passengers in a puther of smoke, steam and smuts of soot through which you could see nothing until the steam dissipated as the brakes finally squealed it to a halt at the far end of the platform. The arrival would be followed by anxious enquiries to station staff from would be passengers as to the exact destination of the train before daring to step on it and inadvertently finding themselves on the way to Crewe when they wanted to go to Birmingham. Oh Mr Porter what shall I do? No station announcements in those days, not at smaller stations anyway, and the big main line stations had public address systems that were so garbled and unintelligible as to be of no use whatsoever. 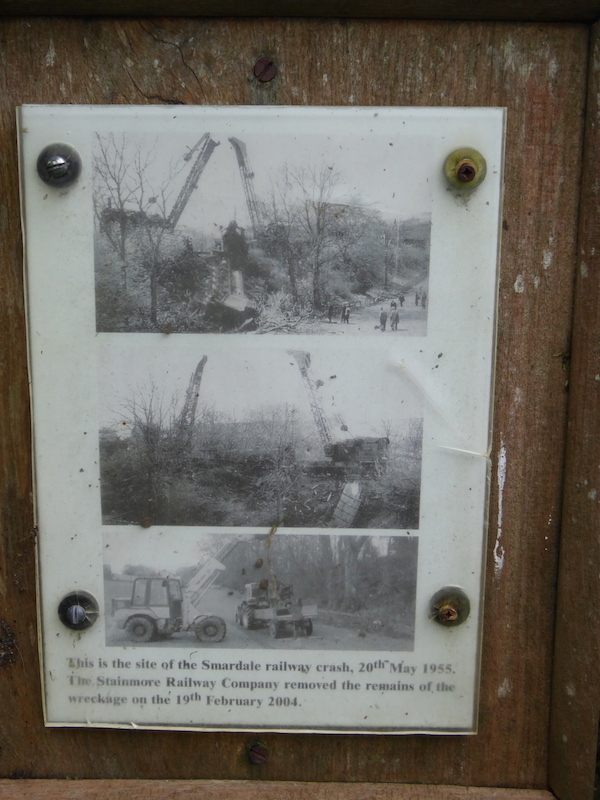 Can we stop wandering down memory lane please and get on with the walk along the railway line? 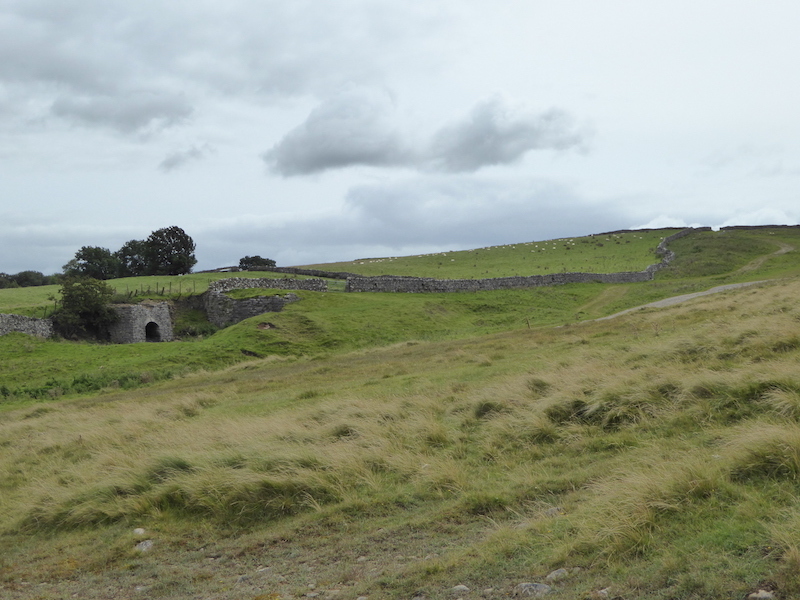 Limestone quarries and lime kilns along the track, where the train wagons would be loaded with lime and then transport it to its final destination. 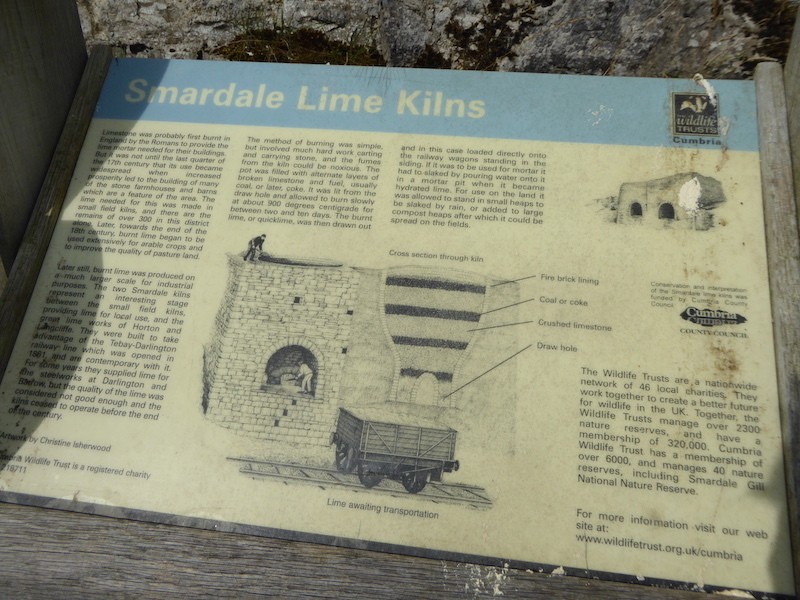 Helpful information boards are situated at intervals along track, this one about the lime kilns …..
….. and this one indicating the various kinds of flora to be seen along the route. 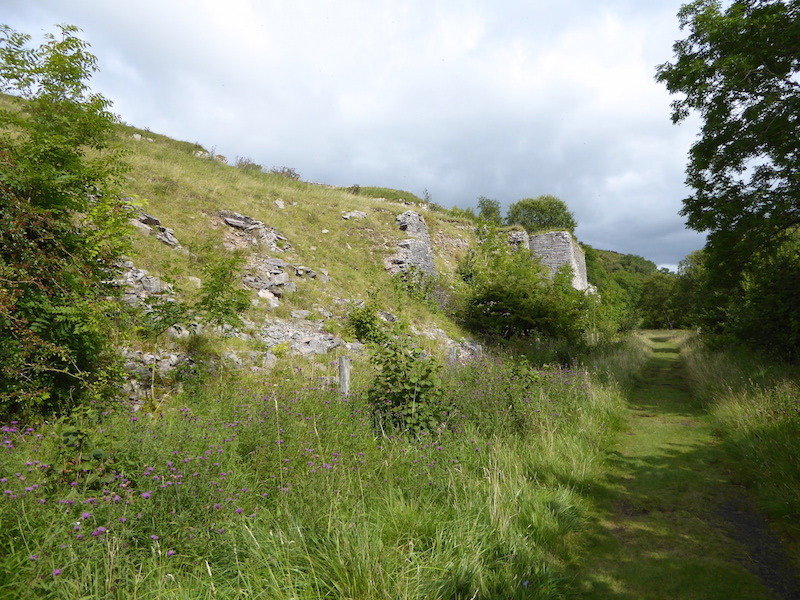 The remains of one of the limestone quarries just beside the track. 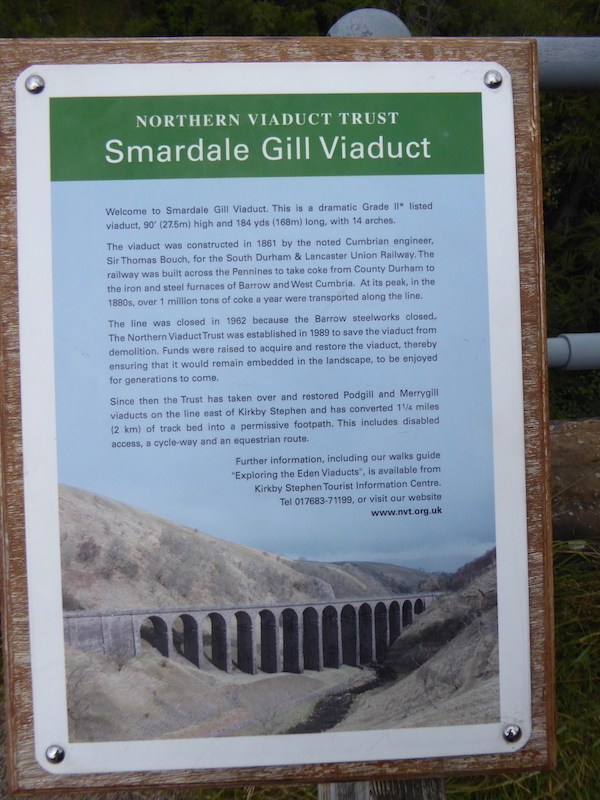 Eventually we reach the Smardale Gill Viaduct …..
….. which was saved from demolition by the Northern Viaduct Trust …..
….. and finally restored to its present day condition in 1990. 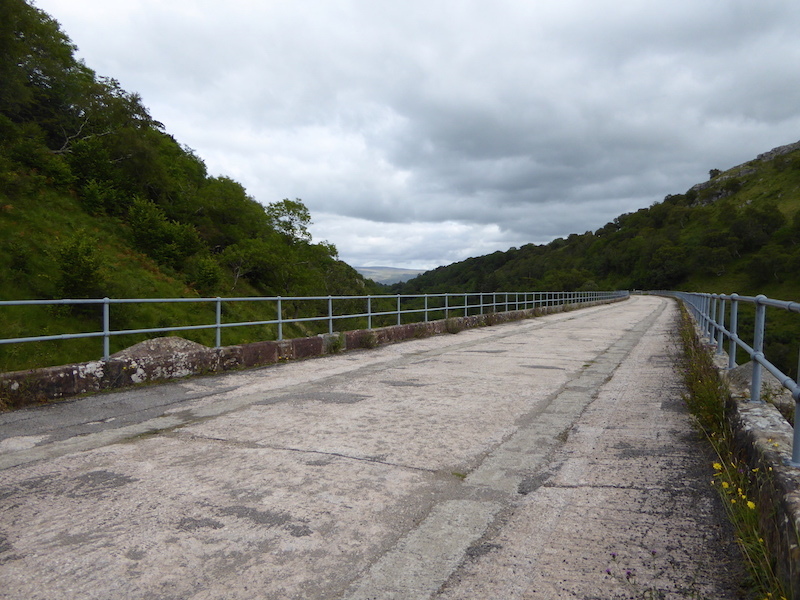 Here are a couple of views of it from the path on the opposite side of the gill …..
….. from where you can view the full length of this spectacular example of Victorian engineering. 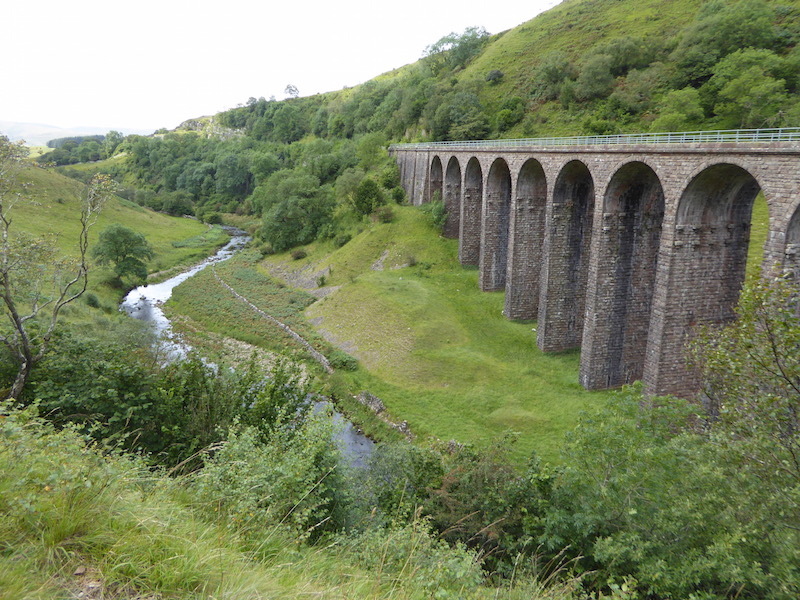 We only walked a short distance along the path on this side of the gill, as we still had a fair distance ahead of us to cover, but it was enough to see and admire the full length of the viaduct, and also to appreciate both the original build and its subsequent restoration. We pass through a gate the end of the viaduct and the track continues through woodland which forms part of the Smardale Gill National Nature Reserve. 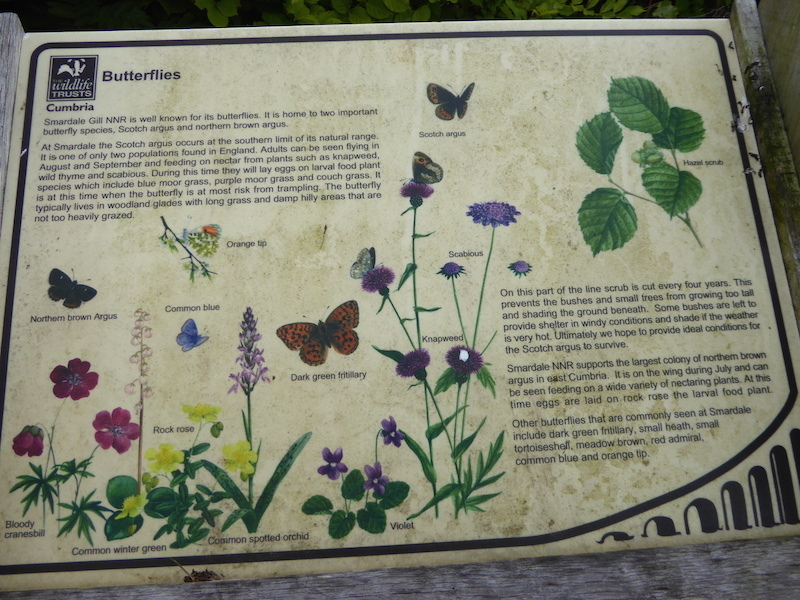 The information board again detailing the wild flowers to be found along the way and that it is home to some important species of butterfly. We did see the Northern brown argus and the Scotch argus varieties mentioned on the board but they didn’t land on anything long enough for me to get a shot of them. 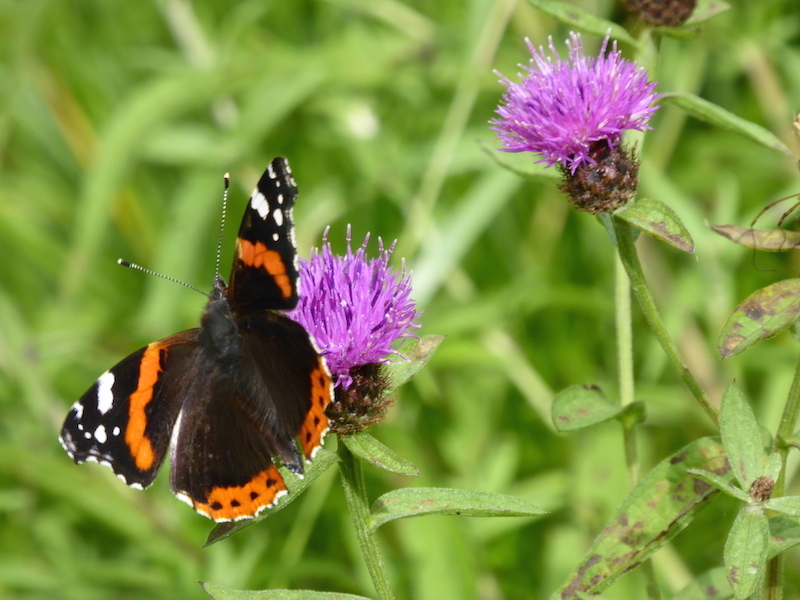 The entire woodland walk was bordered on both sides with wild flowers and punctuated by dozens of butterflies constantly darting across our path in search of the next favourite flower. 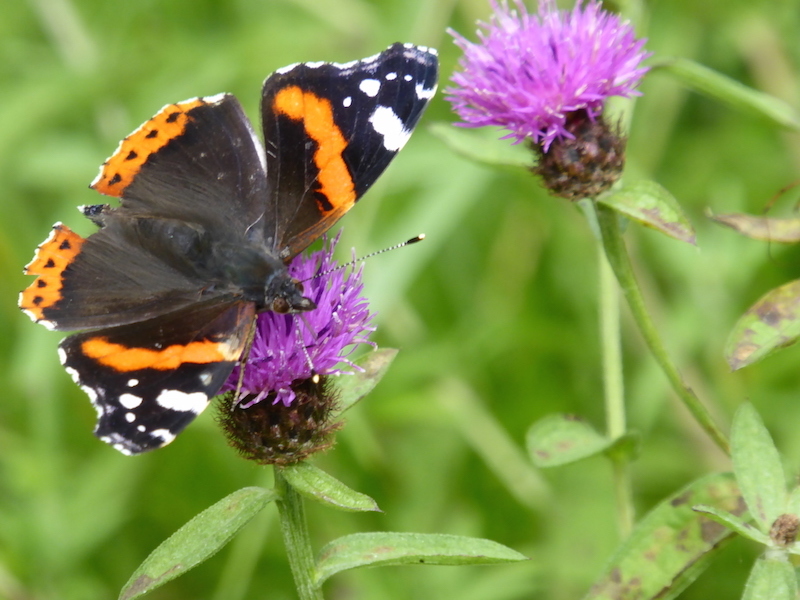 Eventually I did manage a couple of shots of this Red Admiral resting on a Knapweed flower ….. 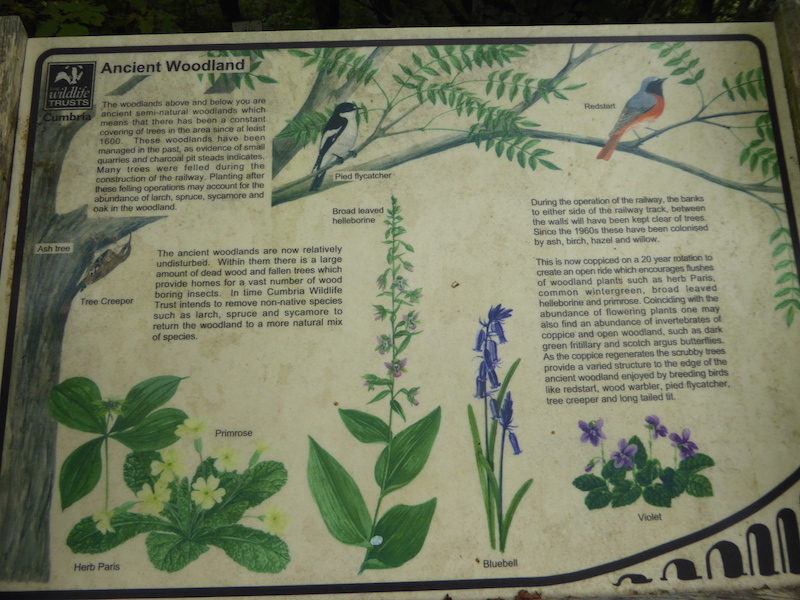 Yet another information board this time giving details about the ancient woodland. 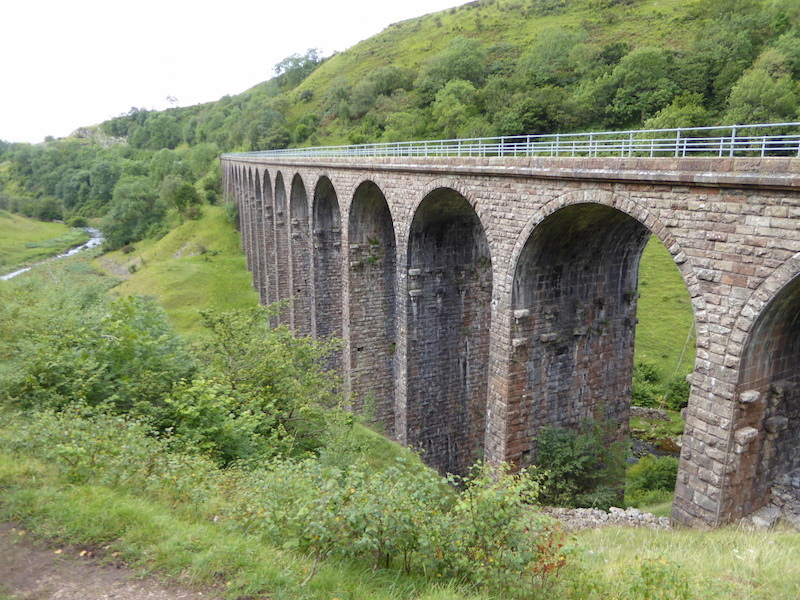 Further along we walk below another viaduct, carrying the Settle to Carlisle line, over which one of those dinky little commuter trains passed just as it was coming into our view. 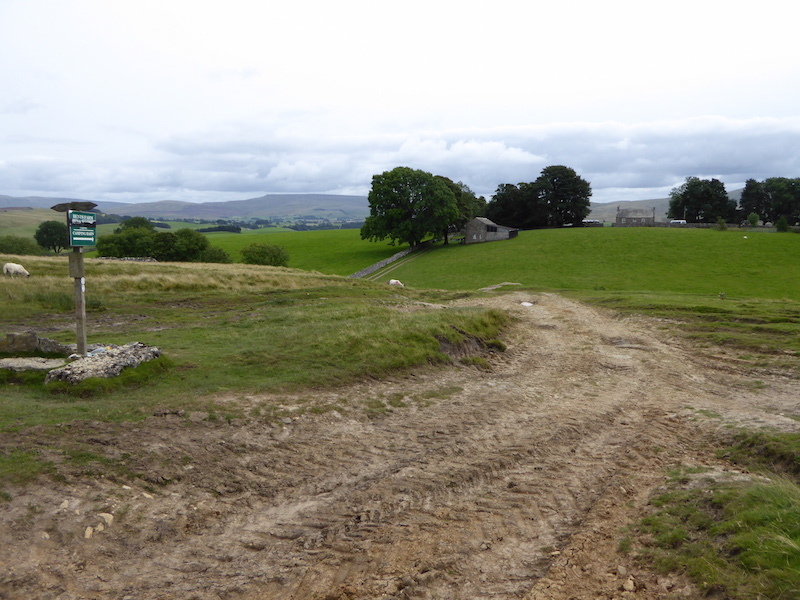 A gap in the track side trees allows us a view over the gentle farmland to the distant Howgill fells. 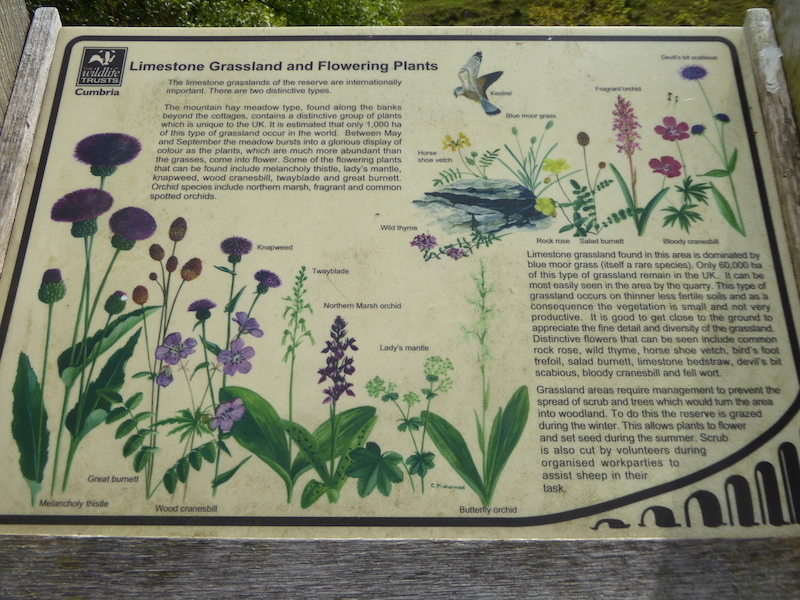 At the end of the railway walk, or the beginning depending on one’s chosen direction, is a large notice board, part of which displays this pictorial guide to the route and various items of interest along the way. 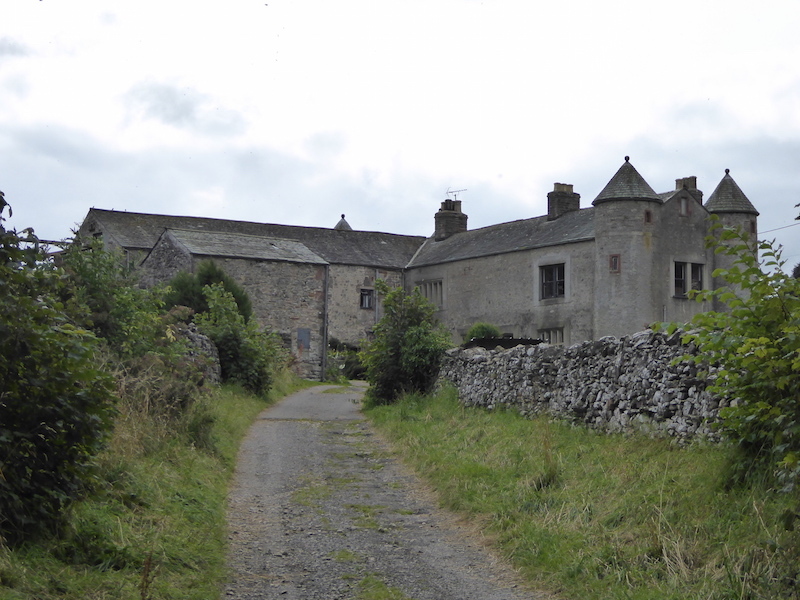 The railway path ends at a rough lane to the right of which stands Smardale Hall. Its private property so I didn’t venture further than the entrance gates to take this shot of it. Originally it was a tower house built in the 14th century but most of that was demolished to enable the building of the present house during the 15th century. From the end of the railway path we take a left turn onto the very narrow and quiet Beck Lane, heading for Crosby Garrett. 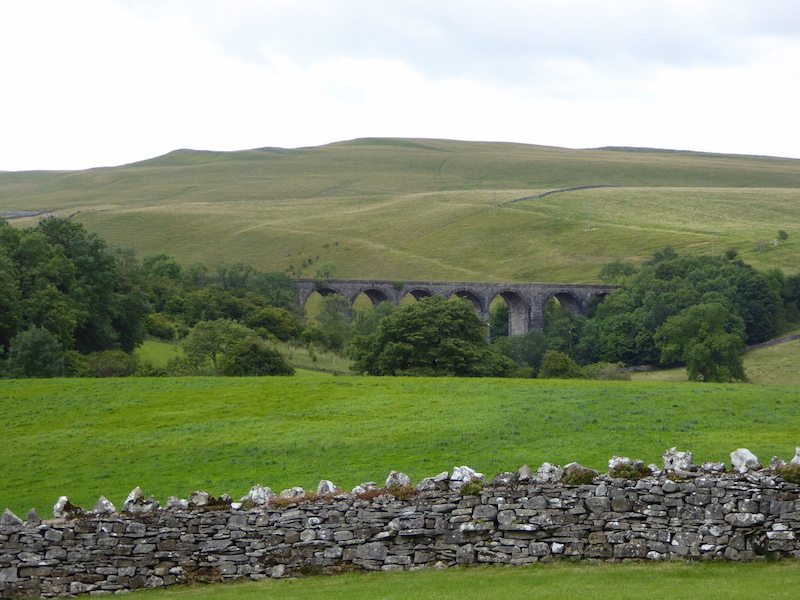 Across the garden of one of the very few houses around Smardale Hall we have a view of the viaduct carrying the Settle to Carlisle line, which we walked under just a few minutes earlier, beyond which is Crosby Garrett fell. 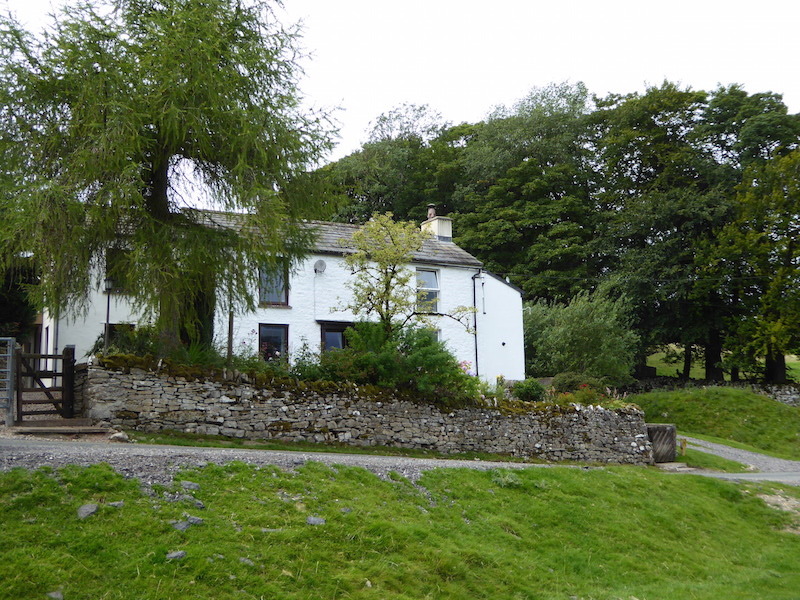 As we were descending the lane towards the beck crossing we could see four walkers coming up towards us, two men and two women, married couples in their thirties probably. As they approached we knew that we were about to be stopped because you can usually spot the ‘we don’t really know where we are’ look on people’s faces long before they have asked you anything. One of the men spoke to us very cheerfully explaining that, as usual, they have this good idea to do something or other and, as usual, find themselves in a bit of a muddle halfway through it. They had a little pamphlet with the outline of a walk on it together with a few lines of direction, the sort of thing you might pick up in a tourist information bureau, but that was all. It turned out that they were aiming for the railway walk in order to see the viaduct so we told them to continue up the hill to the few houses at Smardale, turn off the road down the rough track when they got there, where right in front of them would be the large information board at start of the walk. That’s the board I took a shot of two photos back. One of the women said that they had just come from there, that she had said that’s where they needed to go but the men had decided she was wrong and that they should carry on along the lane. The man holding the pamphlet was trying to decide exactly where they were on the little route map shown, which was nothing more than an elongated oval about three inches long and not very useful. Out came our OS Explorer, 2.5 inches to the mile, so we could show them exactly where they were and where they needed to go, at which point the other woman gasped ‘Oh my god, its miles!” I had to suppress the urge to laugh when she saw, and then understood, the difference in route length between their little pamphlet diagram and the reality presented by the OS map. They may well have started out thinking that it was just a short stroll only to discover otherwise. 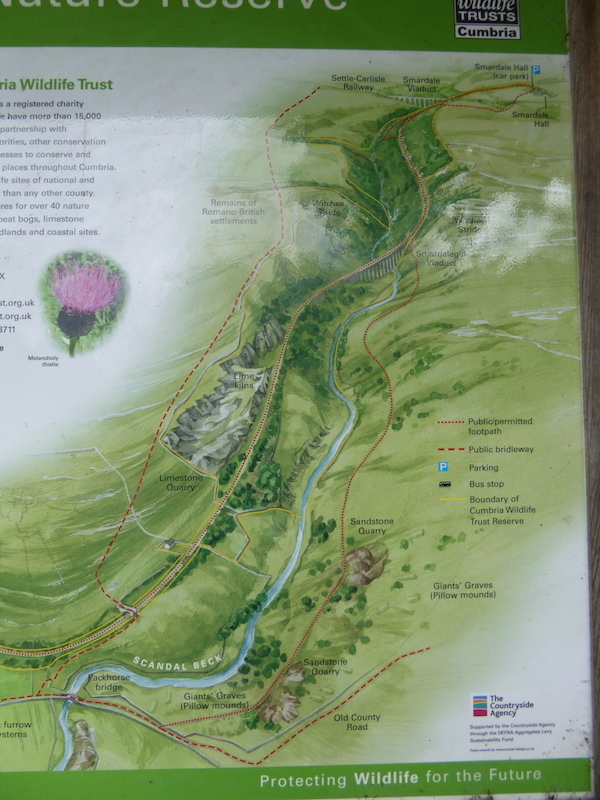 Anyway they had a good look at the OS map, identified where they wanted to go and how to return to their start point. Before we said our goodbyes and good lucks one of the men mentioned the possibility of going back and looking at pictures of the viaduct on Google later. He didn’t quite dodge the dig in the ribs from his wife who was uttering the inevitable “If you think I’m turning back after walking this far …..” The men were very light hearted about the whole thing but I bet the women had something to say the minute we were out of earshot. 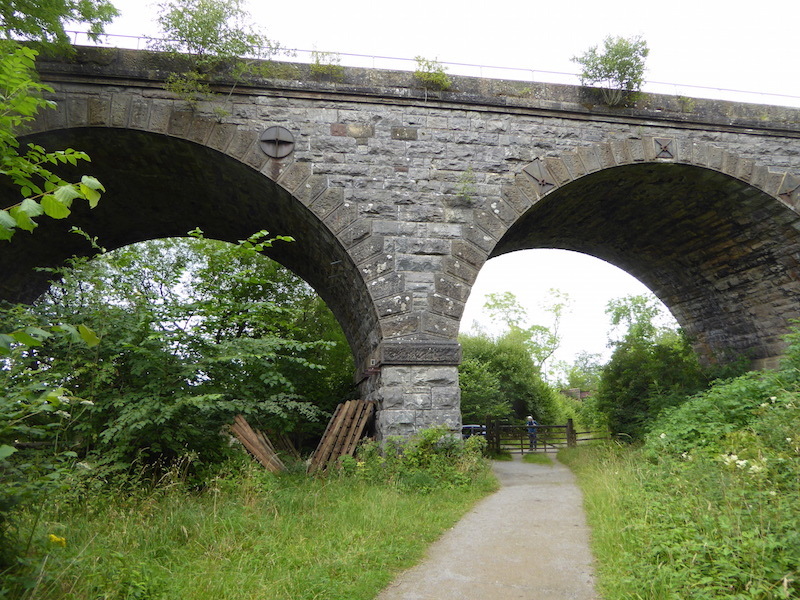 They were a cheerful, happy go lucky little bunch and I really hope they found the railway path, got to see the viaduct and returned home safely. 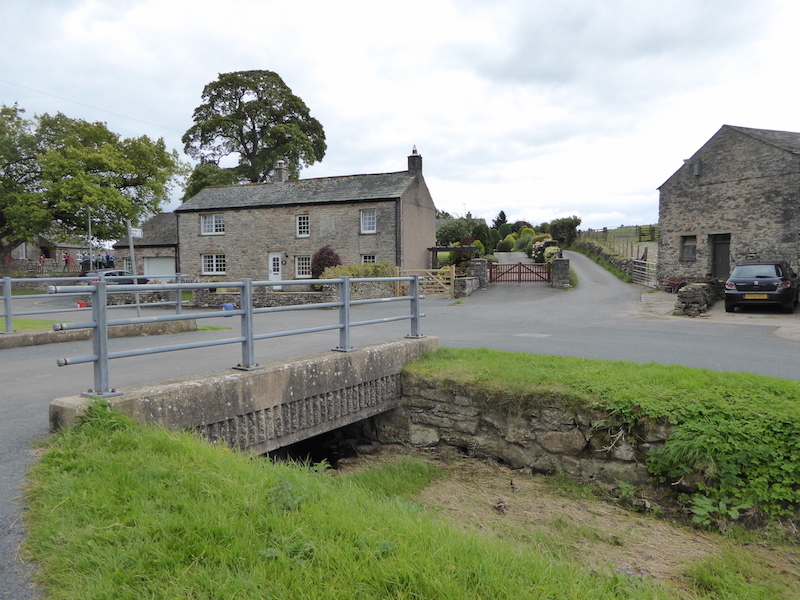 Still chuckling over our encounter with that merry band we continued down Beck Lane and arrived at the ford and bridge crossing Scandal Beck. No, I haven’t missed the ‘e’ off the end, that’s what’s printed on the map. 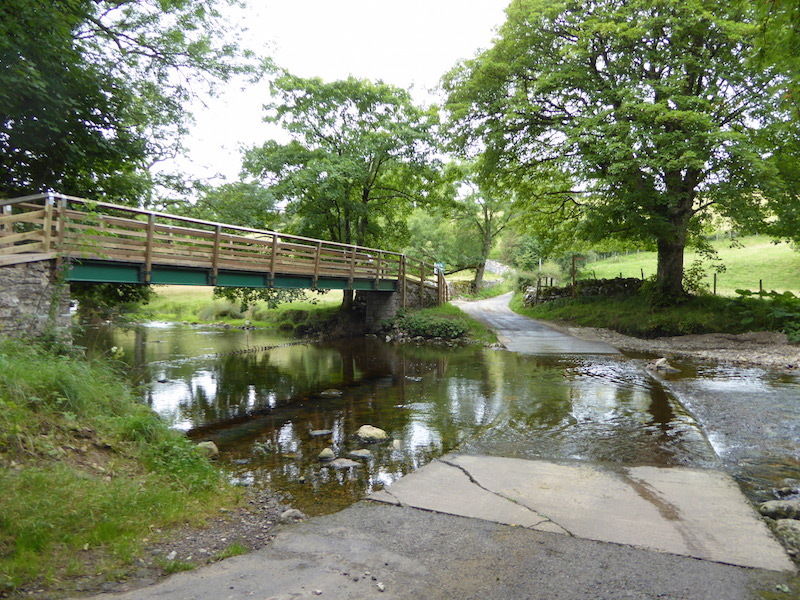 The beck depth across the ford was OK for a vehicle but a bit too much for feet so over the bridge we went and then up the lane beyond and on to Crosby Garrett. The little village of Crosby Garrett where a village fun day, or something similar, was taking place. It was somewhere near this village that the Crosby Garrett Helmet was found by a couple of metal detectorists and later sold for over two million pounds. 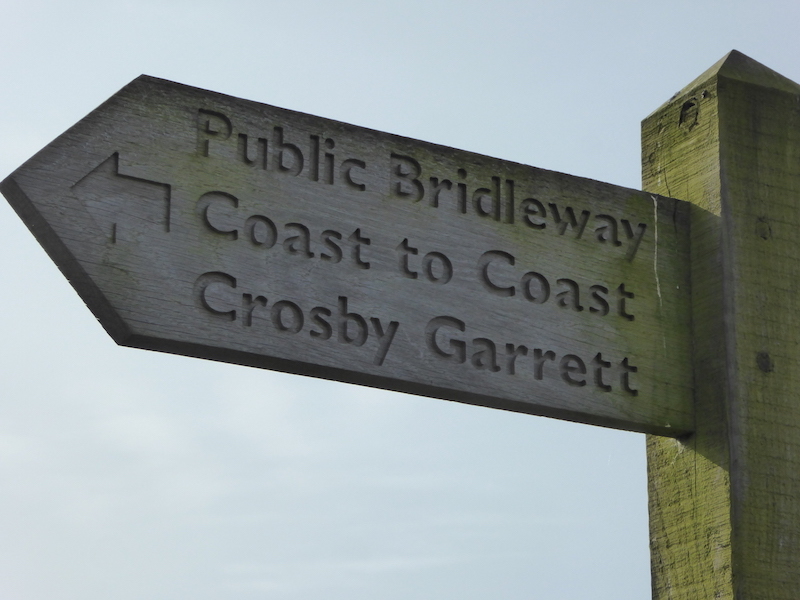 Here’s a link if you’d like to know more about that http://www.telegraph.co.uk/news/8048670/Crosby-Garrett-Helmet-found-in-Britain-sells-for-2.3m.html or just Google it. I wonder how much metal detectors cost? We have just entered the village by the lane immediately opposite alongside the red double gates. 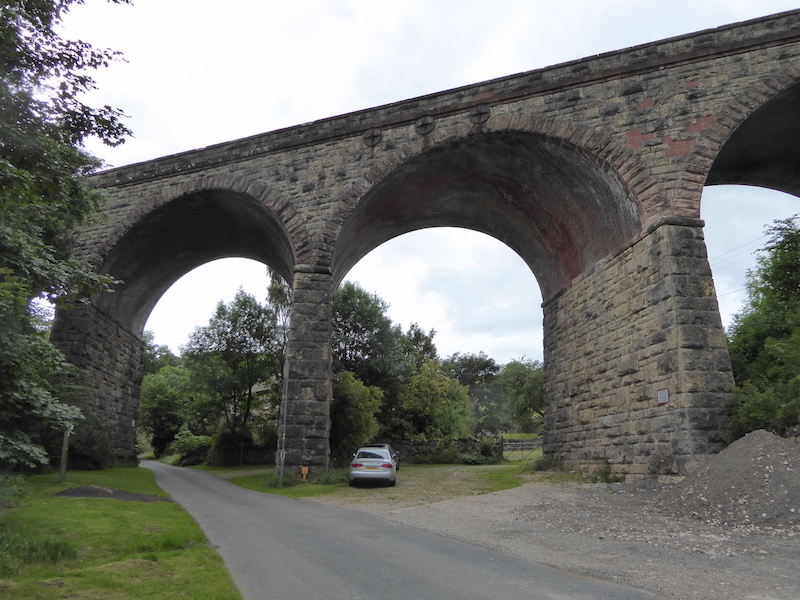 We turned left after crossing the beck bridge and headed up the hill out of the village …..
….. passing below this enormous viaduct, also carrying the Settle to Carlisle line, and carrying straight on up the hill …..
….. on the way passing this circular walled structure which at one time had had a gated entrance. 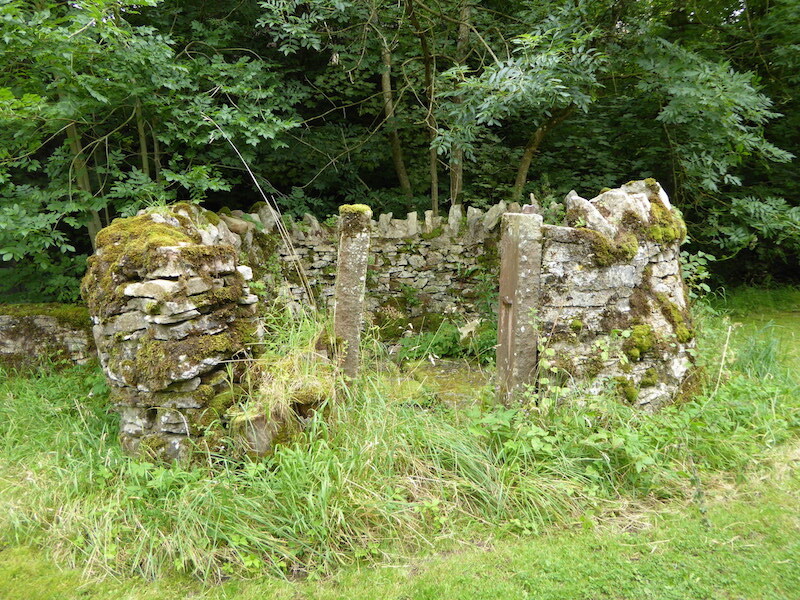 On the ground in the centre were two or three large flagstones which may have been capping off an old well, but there was no information evident as to whether we were right in thinking that or not. At the top of the village is this white house beyond which …..
….. is this signpost where we follow the route up a short rise to the left of a fenced enclosure to Crosby Garrett fell. As we walked by the fence I noticed this at the bottom of it which I could only imagine was a bit of whimsy on someone’s part. There is no golf course anywhere nearby so don’t bring your clubs. 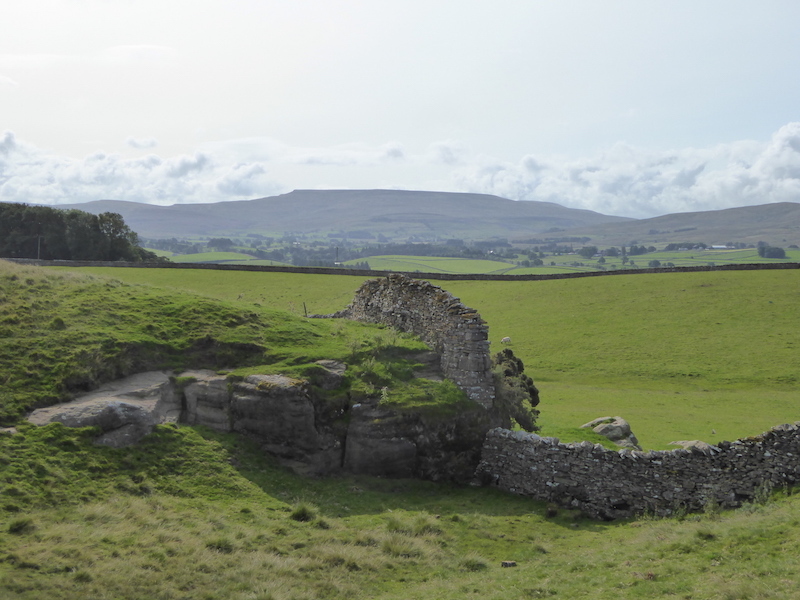 I came up with a very tenuous theory after seeing two vertical stone slabs, without any inscriptions, set in the ground some distance apart from each other further up the fell, similar in size to the one which has the writing on it. 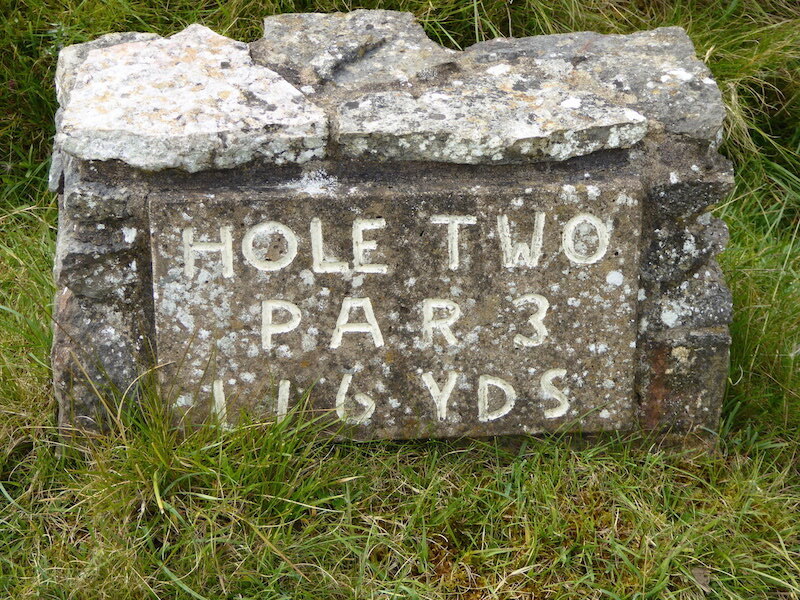 Perhaps this one was indicating, in golfing terms, the distance from here to the next stone slab. Maybe though, on balance it was just someone having a bit of a joke. 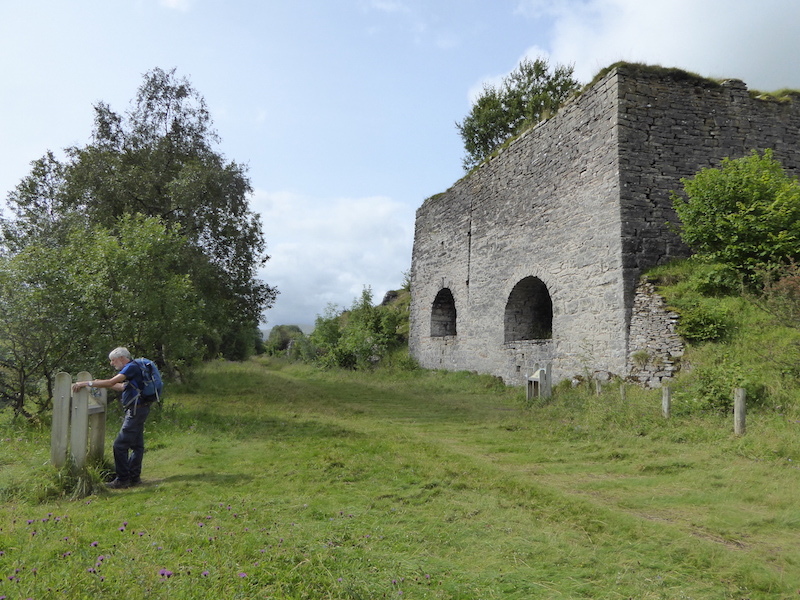 Starting the climb up Crosby Garrett fell with another lime kiln on view at the top of the village. We had stopped here for ten minutes to have something to eat and as we were doing so I suddenly saw white clouds rising in front of those trees behind the kiln. Initially I thought someone had started a bonfire but then a black steam locomotive, pulling a large number of passenger carriages, appeared below and in front of the trees and crossed the rim of the field to the left on its way to pass over to the viaduct down in the village. It went by too quickly for me to put the sandwich down and get the camera out, so I have no photo of it. Back home Google obliged and I found out that it was The Waverley steam loco running a return excursion today from York to Carlisle. 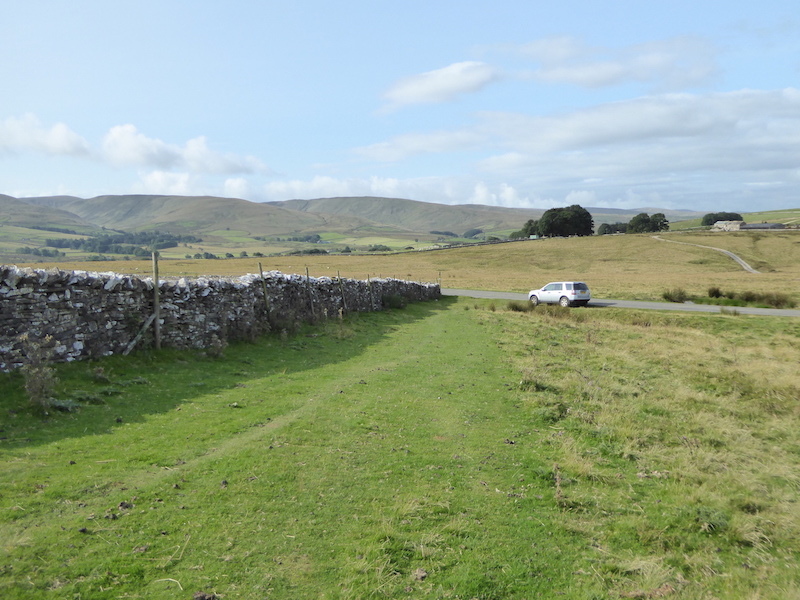 It had passed through Kirkby Stephen, about three miles away at 13.19 and I took the above shot ten minutes later as we were leaving our lunch spot so we had a grandstand view of it just after twenty past one or thereabouts. The remainder of the lunch break passed with the two of us wandering down the railway memory lane again. 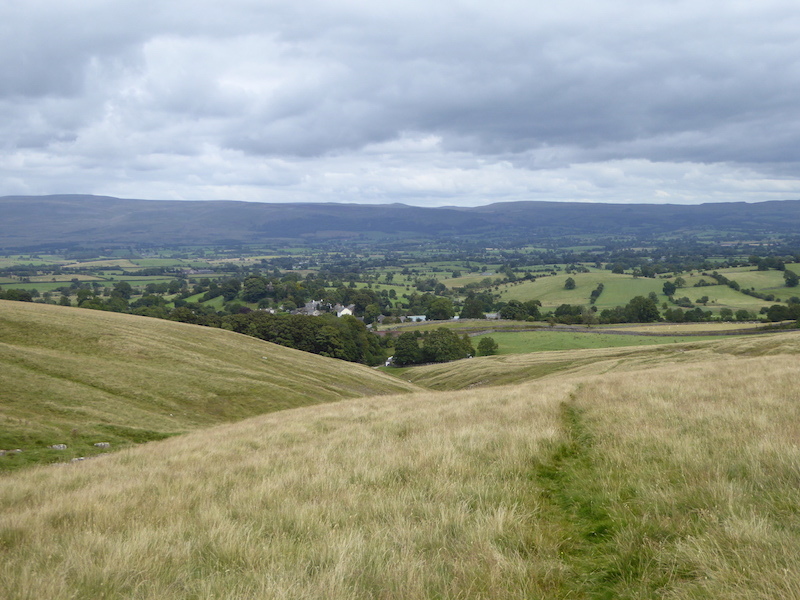 A look back from the climb out of Crosby Garrett up the fell which carries its name. 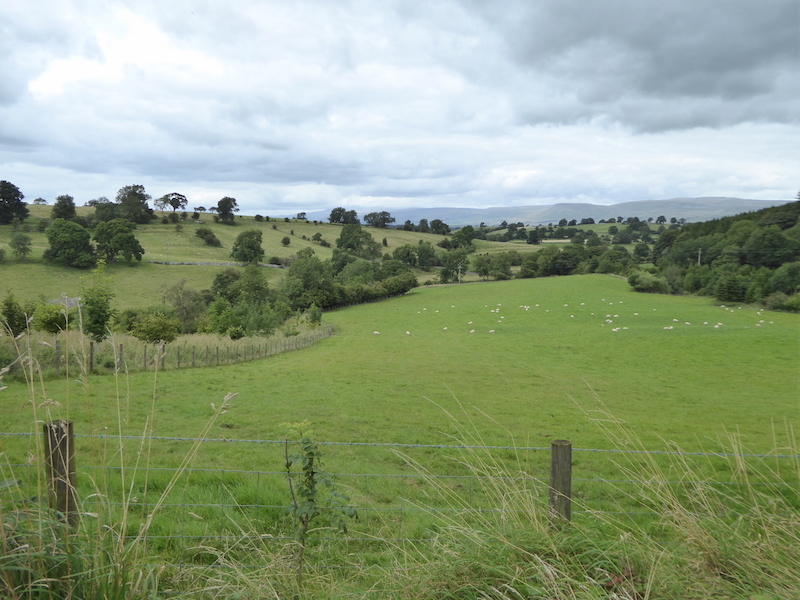 The distant fells are greyed out now, the cloud had thickened and with the height back came the breeze. We didn’t mind the drop in temperature at this point since we were climbing. 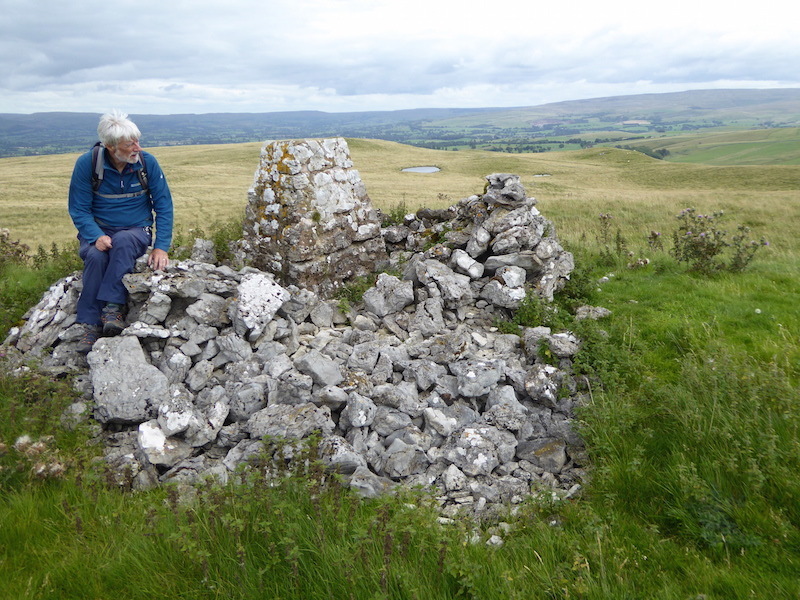 We deviated from the walk’s route directions as we could see there was trig point on the top which we decided to visit but which the walk in the book bypasses. Well, you can’t see a trig point and not go and have a look can you? The trig point, surrounded by a ring of nettles, on the summit of the aptly named Nettle Hill. 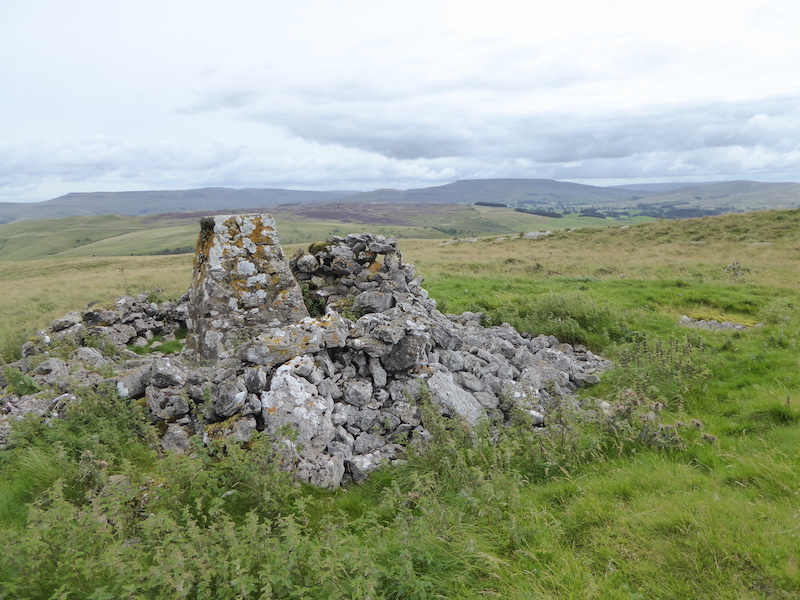 It looks like there’s a shelter around it from a distance but a closer look revealed that it would be difficult to sit down and take advantage of the shortish walled section on the right of the trig column. There was little enough room for your feet never mind a couple of derrieres. 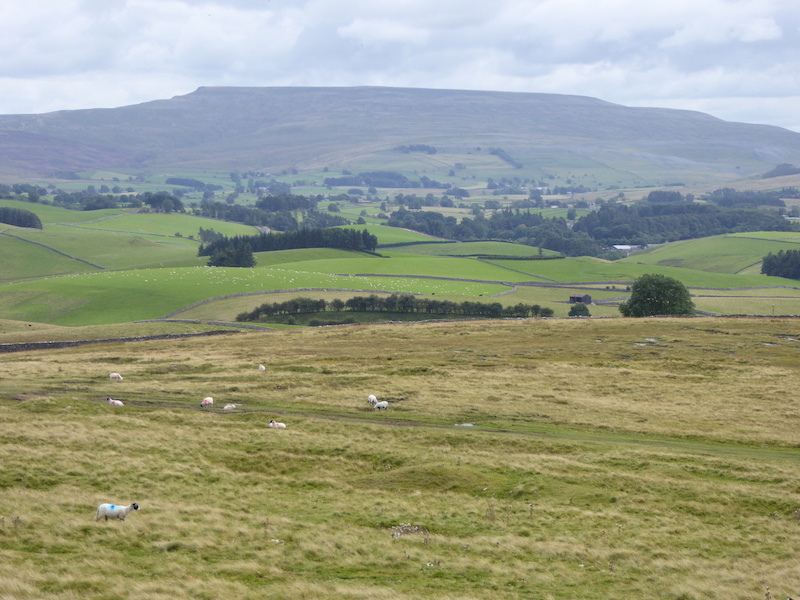 On the distant skyline is the long flat expanse of Mallerstang Edge, on the left, and Wild Boar Fell to the right. ….. where it was rather breezy so I was treated to a different hair style. 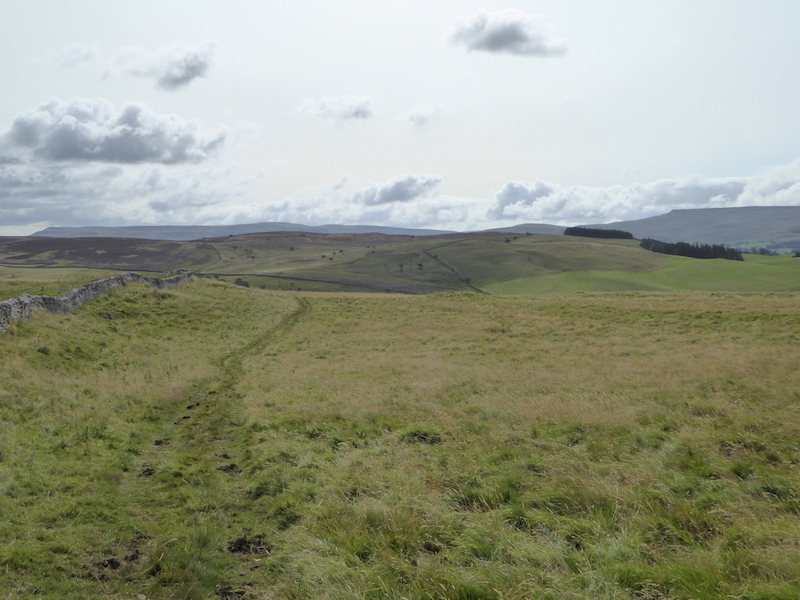 From the summit we head westwards to pick up the established path once again, that’s the darker green patch in the middle of the photo, and passing through the gate …..
….. we make our way back down to Bents Farm. 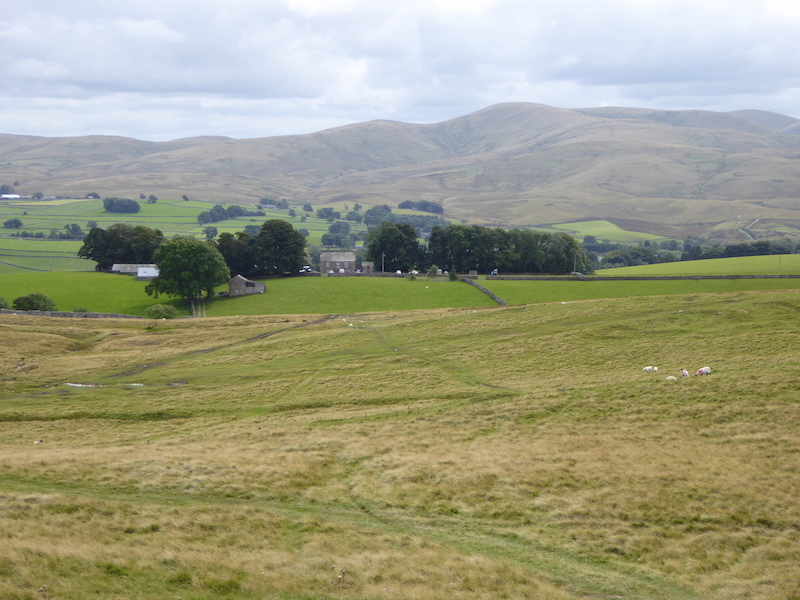 There are paths criss-crossing the fell in all directions but all we needed to do now was aim for the farm. 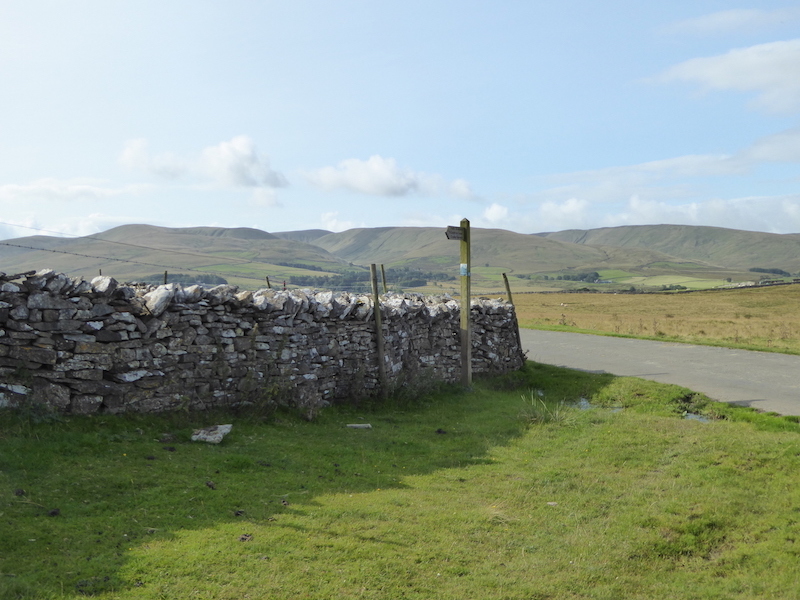 Wild Boar Fell on the skyline as we make the descent. 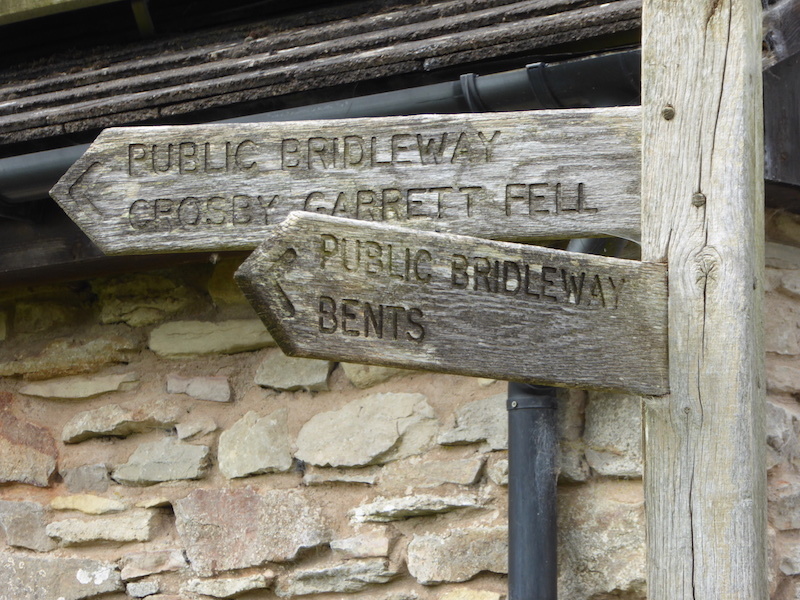 Back at the green sign for Bents Farm where we turn off to the right and retrace our steps back over to the fell road. 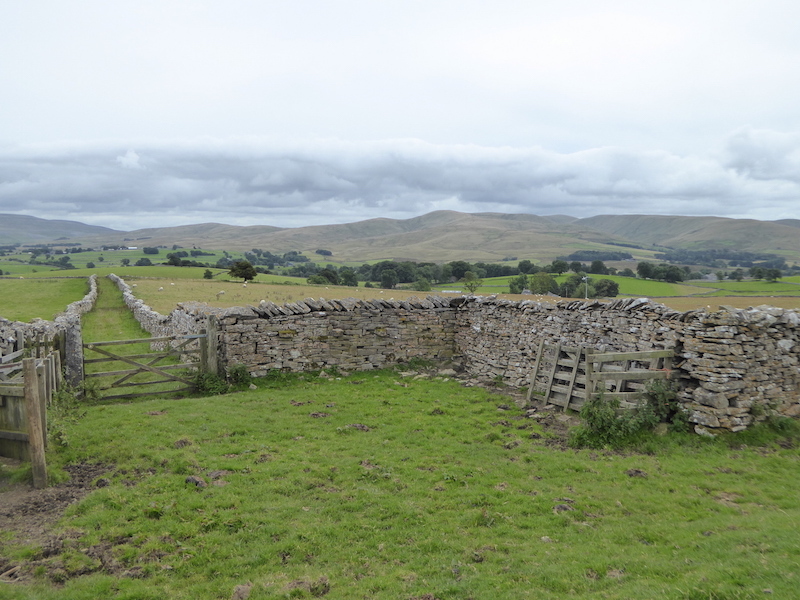 We pass by a little lonning on the way back with a view of the Howgill fells in the distance …..
….. and very soon, almost before we are aware of it, we are back at the fell road and at the end of the walk, which has been a very entertaining and interesting nine and a half miles. We’ve walked a variety of landscapes, crossed a viaduct, learned a bit more about wild flowers, butterflies and lime kilns, seen a collection of unusual and often quirky objects, watched a steam loco excursion appearing to travel effortlessly across a green field, taken a short diversion down memory lane, met up with a cheery, if hapless, band of walkers, and clocked up another trig point and its still only quarter past three. 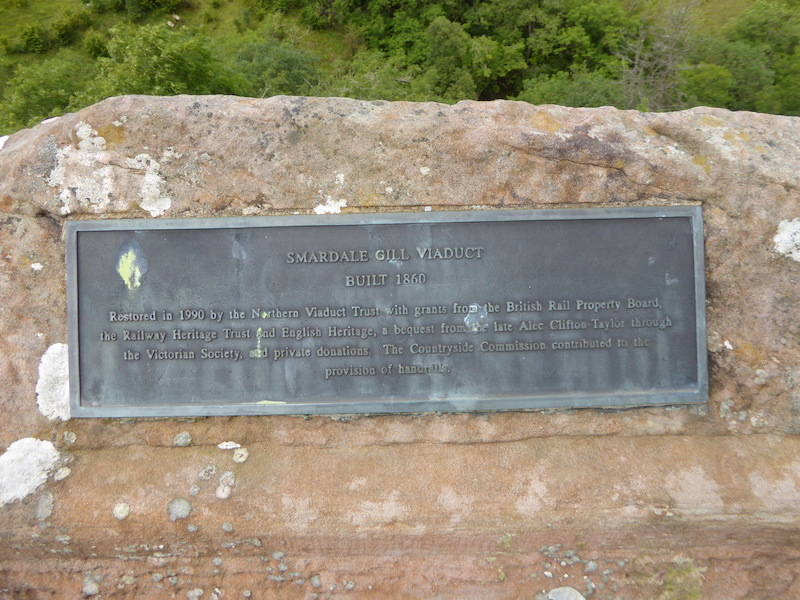 I don’t think there was any more we could have wished to add to this fascinating and very enjoyable walk. 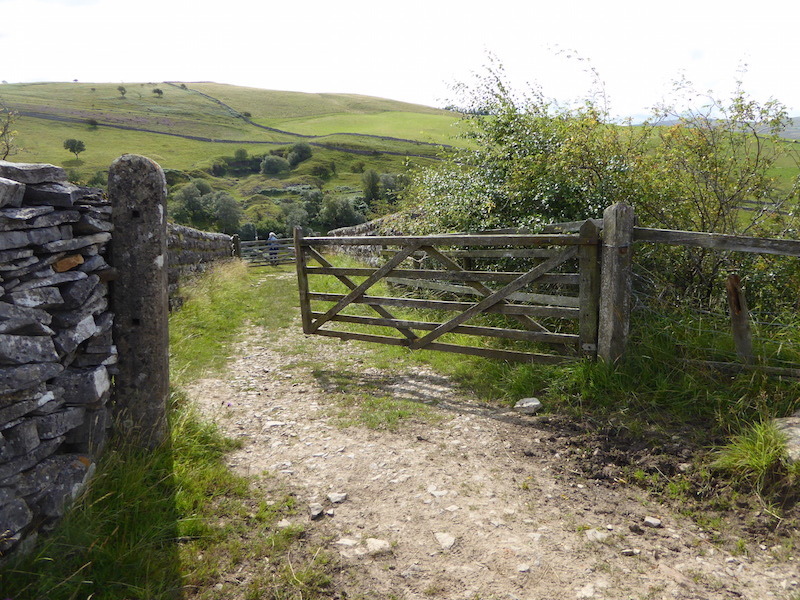 If you’re looking for an interesting walk on a summer’s day, far from the madding crowd, you wouldn’t go far wrong with this one. Its an excellent outing and one I would highly recommend. We came home with dry boots too!